Custom GOBI Ladder for the ECamper allows outside access to the bed or racks. 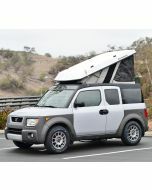 The Gobi Honda Element ECamper ladder is designed to conform to the rear hatch, adding style and easy external access to your Honda Element ECamper or roof mounted racks. The ladder is mounted using clamps and bonding tape, it is not intended to be removed easily. All stainless steel grade 8 hardware used. Please note that this price includes installation as part of an ECamper conversion. To order this ladder for self installation as a retrofit, please select the ladder listed in our accessories section.